Is Shaun Marcum Burnt Out? As Shaun Marcum takes the mound for Game 2 of the NLCS against Milwaukee tonight, the shadow of a 4.2 inning, seven run implosion against Arizona in Game 3 of the NLDS will loom large. But Marcum’s first playoff start is the only recent negative for the right-handed changeup specialist: Marcum has only put together two solid outings since the calendar flipped to September. After hanging seven innings of shutout, one-hit ball against the Astros on September 4th, Marcum has made five starts (including the playoff outing) for a total of 29 innings, 25 earned runs (a 7.76) ERA, a rough 18-to-11 strikeout-to-walk ratio, and six home runs. The playoff start puts the 29-year-old’s innings total for the year at 205.1, a career high, just over the 195.1 he posted coming off Tommy John surgery last season. With Marcum, never a picture of durability, we must ask: Are these struggles just the struggles pitchers work through over long seasons, or is he burnt out after the longest season of his career? 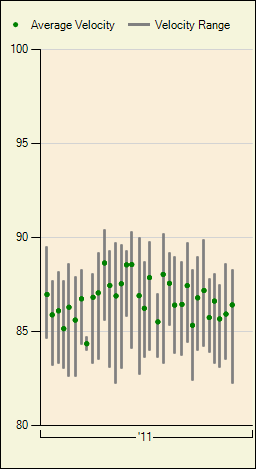 With Marcum’s struggles beginning essentially after 175 innings, the first course of action is to take a look at if Marcum had these same troubles when he hit this mark in 2010 with Toronto. And although his ERA was a touch high at 4.19, his peripherals were just as good and it wasn’t even a matter of BABIP, either — somehow, opponents managed 10 runs (9 earned) despite only 18 hits, two walks and two home runs. Marcum tallied 14 strikeouts as well — no signs of breakdown there. We do see a definitive drop in velocity, but Marcum’s velocity of late is essentially the same as it was at the beginning of the year — Marcum’s most productive slice of the season, as he carried a 2.06 ERA through May 5th. Considering Marcum remained in a roughly two MPH range the entire season and he isn’t really a pitcher who depends on his velocity to get outs, this doesn’t seem like a culprit either. 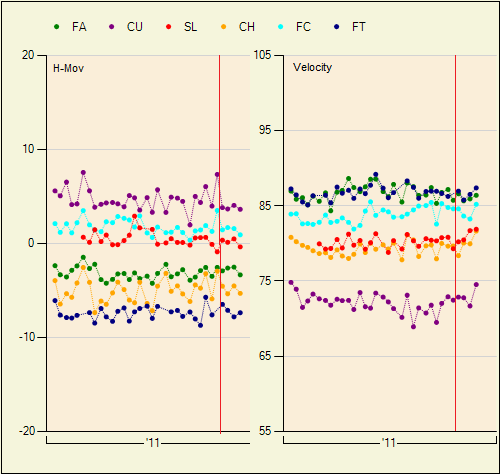 In all four instances, we see Marcum’s horizontal changeup movement (the orange) was around its average horizontal break but came in a couple miles per hour quicker than usual. This continued in Marcum’s start against Arizona, as his changeup averaged around 81 MPH (as opposed to 79 MPH for the overall season) and had 4.4 inches of horizontal break in to righties. It simply hasn’t been very effective over this time period, either, going for strikes in 10% fewer instances and getting put in play nearly three percent more often. But if there’s anything to indicate the ineffectiveness of Marcum’s changeup, it’s that he just hasn’t thrown it nearly as much in this stretch of struggles. In the one good start — September 20th at Chicago — Marcum threw 19 changeups in 97 pitches, or 19.3%, under but reasonably close to his average of 26.7%. The other four starts, however, haven’t been anywhere near this mark, ranging from 15.5% (9/9 against Philadelphia) all the way down to 8.9% (Game 3 against Arizona). I don’t know if there is a definitive answer the the original question here — only Shaun Marcum himself and maybe the Brewers’ training staff knows if Marcum’s arm is shot from his workload. But we do know that his changeup, his bread-and-butter pitch, just hasn’t been the reliable, go-to pitch he needs it to be for him to get batters out on a regular basis, and it wouldn’t be surprising at all if Marcum’s arm were giving out under the pressure of a long, 200 inning playoff season. Marcum’s changeup will be the key pitch to watch tonight — if it’s flat and at too similar a speed to the fastball, we could be in for a repeat of Game Three in Arizona. If it’s back to the slower, diving pitch that gave him success early in the year, then Marcum has a chance to right the wrongs of the past month. We hoped you liked reading Is Shaun Marcum Burnt Out? by Jack Moore! Very good stuff. Thank you. Tho’ the Brewer Fan in me now hates you.